On February 5th, participants of the Energy and Global Security Directorate (EGS) Support Administrative (SA) Staff Mentoring Program gathered to reflect on their first year of growth and learning and to plan for the next year’s activities and goals. Keith Bradley, Director, National Security Programs and recipient of the 2014 Outstanding Staff Mentor Award, opened the session with welcoming remarks on the importance of mentoring and key elements in building a mentoring relationship. Keith Bradley delivers welcome remarks at the EGS-SA Mentoring Program celebration. EGS Support Administrator Supervisor, Wendy Torres provided an overview of how the EGS-SA Mentoring Program was formed. In November 2017, the Energy & Global Security (EGS) Diversity & Inclusion (D&I) Council introduced a Mentor Program for support administrative staff in the directorate in response to overall concern from EGS employees regarding lack of professional development opportunities. This concern, identified through the ‘What’s Next Diversity & Inclusion Climate Survey,’ was on the Council’s proposed list of action items for 2017. 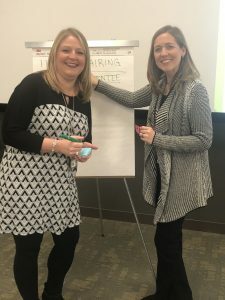 While it was agreed that a Mentoring Program would be valuable for all EGS employees, it was thought that the support administrative staff could serve as a pilot program. A discussion, facilitated by Postdoctoral Program Lead Tina Henne and EGS D&I Council Chair Molly Finster, with the EGS support administrative staff, successfully confirmed the need for and interest in a mentoring program. As a follow-up to the facilitated discussion, the D&I Council mentor subcommittee surveyed the EGS support administrative staff on topics of interest, areas of expertise, and desired program type (i.e. mentor-mentee, group, or both). Based on their individual feedback, Torres, facilitated 13 mentor-mentee pairings and identified many topics for group mentorship events (such as procurement, travel, honorariums, BOX, etc.). In November 2017, a formal kick-off of the program served as the perfect opportunity to make introductions and to review the guidance document prepared by the D&I Council subcommittee, which provided useful tips and tools for mentor-mentee pairings. Throughout the year, the turnout at group mentorship brown bag events was an obvious indicator of success, averaging 22 attendees per event! 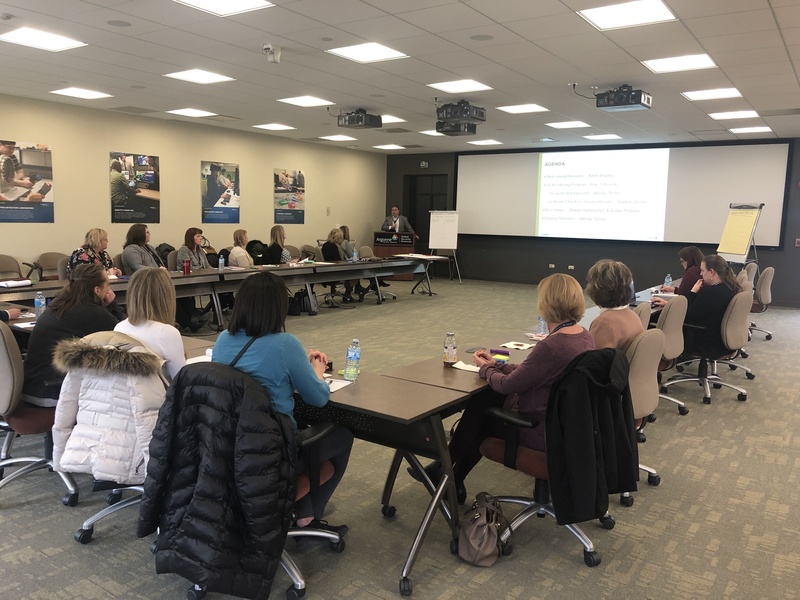 Following Torres’ recap of the program, IAEA Training Coordinator and EGS D&I Mentor Subcommittee Member, Natalie Zender, provided a summary of feedback from the Mentoring Program participants based on a survey that was sent by the EGS D&I Council at 6 months to check-in. Nearly 50% of respondents attributed the program to improving their skillset and other positive feedback included feelings of empowerment and benefits of networking. Still, opportunities for improvement are evident and mainly reside with the mentor-mentee pairings, which for almost a quarter of respondents are no longer active. Susan Podoba (left) and Wendy Torres (right) lead a group activity at the EGS-SA Mentoring Program Celebration. To close the event, Mentor Subcommittee Members, EGS Directorate Executive Assistant, Susan Podoba, and AMD Division Executive Assistant, Sharon Nykolyshyn, led an exercise where participants shared their ideas for future group mentoring sessions, brown bag training and professional development topics and renewed interest in being a mentor, mentee or both. More than providing an avenue for staff to find a mentor, the EGS-SA Mentoring Program is helping to build a culture of mentorship, which goes hand in hand with modeling Argonne’s Core Values: Impact, Safety, Respect, Integrity, and Teamwork. Mentoring is a professional relationship that promotes talent development and trust by bringing employees together to share knowledge, skills, and experiences. We can all benefit from wider access to opportunities which aids to professional and personal goals to build a more capable, satisfied, and committed team.